A lot of question I receive are about District Enforcement‘s likely-hood of taking driver’s to court. The answer to this is question is that it is very possible. From 1st January 2014 to 31st December 2014, the company took 787 drivers to court for non payment of Parking Charge Notices. That is not to say you shouldn’t appeal, or that you can’t beat them in court. The reality is that District Enforcement Limited issue court proceedings against people in the hope that they just pay up when they receive court papers. Suzy received a District Enforcement PCN at Staffordshire university for having an “invalid permit”. Suzy did have a permit, but it had slipped forward and was partially obscured, but nonetheless partially visible. Suzy appealed to District Enforcement which was reject. She then appealed to the Independent Parking Committee (IPC) which is the independent appeals board. Her appeal to the IPC was also rejected. Suzy then received a “letter before action” from Gladstones Solicitors and then finally a County Court Claim for£120. She submitted her defence to the claim and awaited her day in court. On the day of the court hearing, District Enforcement’s solicitor didn’t turn up, and so the judge reviewed their witness statement in their absence. District Enforcement’s claim was dismissed by the judge. This was essentially because Suzy did have a valid parking permit on the day, and the serial nubmer was still visible, even though it had partially slipped down the dashboard. The judge voiced her annoyance that District Enforcement had pursued Suzy the County Court for such a minor amount. She was also clearly annoyed by DE’s non-attendence. Districe Enforcement had maintained up until the very last minute that would see it through to court and prior the hearing had threated Suzy with £385 in costs should they win. But it was all bluff and bluster and DE didn’t even show. In this District Enforcement sign, clause six states that you cannot be “Parked so as to cause any obstruction or inconvenience to others or otherwise block any other vehicle’s path” and clause four states “not parked wholly within a marked bay”. 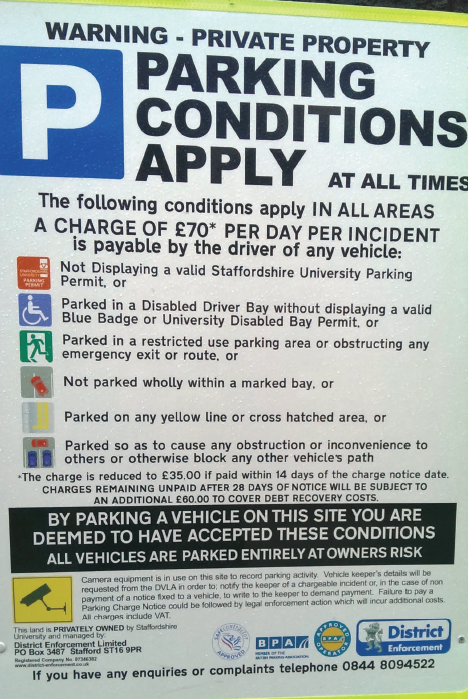 District Enforcement have the parking contract with Staffordshire Unversity. Thousand’s of staff and students have fallen into the trap set by District Enforcement at Staffordshire University. DE has two directors – Dyl Kurpil and Graham McKie although Graham McKie appears to have left. Any Staffordshire University staff or students who received a parking charge notice from DE should who received a Put in a formal complaint with the university and head it up with those words ‘FORMAL COMPLAINT’ and sent it to Linda Degg. It should also be noted the parking contract did not go to tender and that District Enforcement Ltd got the contract through some sort of non competitive process. Thousand’s of staff and students have fallen into the trap set by District Enforcement at Staffordshire University. DE has two directors – Dyl Kurpil and Graham McKie although Graham McKie appears to have left. Dyl Kurpil has a law degree and is also an ex policeman. Any Staffordshire University staff or students who received a parking charge notice from DE should who received a Put in a formal complaint with the university and head it up with those words ‘FORMAL COMPLAINT’ and sent it to Linda Degg.